Sooooo last week I made a bold move. I stood up for myself in a situation that has been perturbing me for a year. Several people have told me they are proud of me for taking a stand. Some have said they are inspired to address situations in their own lives. I decided this was a good conversation to have with you all. Do you have conundrums in your life that you need to figure out how to address? Challenges with family, friends, work, business, church…..we all do sometimes. How you handle the situation is just as important as the situation itself. Here are seven tips to help you stand up for yourself effectively. Pray – The first thing you should do in any challenge is to pray. Whether it is an immediate danger, or long-term situation. Go to your center, which is your spirit and connection to God, and pray. 2. Patience – You have to give a situation the chance to work itself out. You also have to…this part is very important…give yourself time to observe the other people in the situation. That may be THEE most important part. Sometimes situations come to us so that we can see the character of the people involved. So, whatever your dilemma, take some time to think about it, before you act. 3. Wise counsel – It is a good idea to speak with someone that you trust about the situation. I often hear people talk about being private, keeping your business to yourself, and ‘making moves” in silence. I only half agree with that. Side note-that has been my saying lately, “I only half agree with that!” I think I will make that my next blog post! Now back to the subject at hand. Yes, there are times when you should keep your business to yourself, but there are probably MORE times when you shouldn’t. 4. Trust yourself – At the risk of sounding cliché, you have to trust yourself. When you have patience, give the situation time, and speak with a few people that you trust, THEN you have to trust yourself to make the right decision. Nobody knows YOU…like YOU! At the end of the day (another expression I like 😊) you are the one that has to deal with the situation. Only you know how much you can bare. You have to trust yourself, that you have the answers within. 5. Timing – I wrote a blog called Timing is Key http://latoniawalker.com/2016/09/18/timing-is-key/ and discussed how you have to do the right thing, at the right time. For example, my next educational goal is to obtain my PhD. However, when I weighed the timing, I determined that I needed to wait until my daughter finishes high school and goes off to college. There have been many other situations in my life which have shown me how important timing is. My advice to you is to wait for the right timing to stand up for yourself. You have to wait until just…the…right…time. It depends on the circumstances, and what you want to accomplish. Should it be at the height of confrontation, or when the dust settles? A certain season, winter, summer? Do you walk away with nothing, or get something out of it? Is there someone that you need to address, or just leave, stop, or end it? 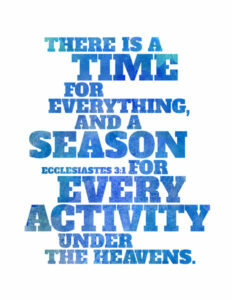 All of these things need to be pondered while you determine timing. 6. Spirit/Attitude – When the time comes, take action with the right spirit. What do I mean by this? That you do not have to be mean, nasty, irate, or evil in order to stand up for yourself. You can do it in love and peace. This will also set the tone for the outcome. People often confuse rudeness with standing up for themselves. Or being physically threatening with being strong, particularly if you are from an Urban environment. I am here to tell you that you can stand up for yourself and be strong, without any of those negative characteristics. DON’T LET THEM STEAL YOUR JOY! Getting you upset is usually what people want. Misery loves company. Hurt people, hurt people. Do these sayings sound familiar??? We all know this, so don’t let them win! Do not let them get the satisfaction! Another reason to have the right attitude is for your own personal growth. You shouldn’t be 50, still acting like you are 10! Maturity, emotional intelligence, cognitive development, impulse control, level headedness, these are all characteristics that you should strive to develop. 7. Have Courage – Lastly, have courage! Standing up for yourself can be scary. Remember our conversation in Do it Scared? http://latoniawalker.com/2016/09/04/do-it-scared/ You may be scared, but you should do it anyway. Sometimes people mistakenly think that having courage means that you are never scared. That isn’t true. Having courage is standing up for yourself even when YOU ARE scared. Courage is not letting fear cripple you. Scared and all, I encourage you to Stand Up for Yourself! I hope that these tips will help you to face some challenging situations in your life. 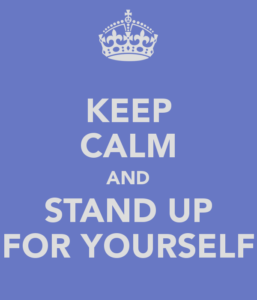 There will be times when you need to Stand UP for yourself. Start with prayer, have patience, seek wise counsel, trust yourself, wait for the right timing, display the right attitude, and have courage! You can do it! I believe in you! Thanks for the tips. They all are right on point and I need to make sure I trust myself and my capabilities to achieve my goals. LaQuetta, You are welcome. Yes, trust yourself! I wish you the best! Thank you! I am happy that you received some inspiration from it.